You are using Parallels Desktop and planning to upgrade to the latest version? Or do you want to install Parallels Desktop from scratch? Either way, you will need your Parallels Desktop for Mac license key to do that. Let me walk you through some simple steps on how to locate and manage Parallels Desktop activation keys. Whether you upgrade, or choose to install a brand new copy of Parallels Desktop, you will need to purchase a copy of the product on Parallels website, choose version, edition (Standard or Pro) and select the respective option: “New license” and “Upgrade”. Upgrade option for Parallels Desktop 12 is available for version 10 and 11 users. If you have Parallels Desktop 9 or earlier, you will need the full version license (by clicking on “New license”). If you need a full version license, once the payment is done, you will receive your Parallels Desktop key via email and then register and activate it. If you have the upgrade version of Parallels Desktop, this process has one difference – you will need your previous version key to complete the activation. That’s exactly when you need to find it. No worries – this is uber simple as well! If you already used Parallels Desktop and got the previous version you can find your key registered in Parallels account. There we have 2 options: Parallels Desktop subscription and perpetual license key. Log in to your Parallels account. If you do not remember the password to your Parallels account, please restore it. 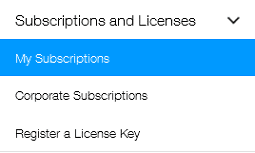 Go to Subscriptions and Licenses > choose My Subscriptions > and copy your key. 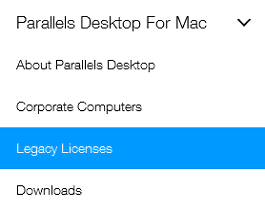 And if you purchased perpetual license few years ago, go to Parallels Desktop for Mac > Legacy Licenses in order to find it. Check your email. Parallels Desktop activation key had been sent to you via the confirmation email order after you completed the purchase. Check if you registered your key under a different account (email). Try different email address to login into Parallels account and go through “My Subscriptions” and “Legacy Licenses” tabs. If you didn’t purchase your key from Parallels online store and used one of the reseller websites, you also got an email with license. Please check your order confirmation email sent by the reseller to locate the key. In case you purchased a boxed copy of Parallels Desktop, the key should be located inside the box. You could also get a box with a code and instructions to redeem it to get your activation key. This article provides you with more information. Also please note that you key couldn’t be registered and that is one more reason why you cannot find it. If it is that case and you purchased Parallels Desktop for Mac from the Parallels Online Store, please click here to retrieve your key. If none of the above methods worked, contact Parallels Support on Twitter and Facebook, we are always here to help! Hi Parallels Team, I also tried to move my Parallels Desktop 10 license to a new mac and got the activation limit problem. I tried to follow the deactivation instructions, but it seems that this is not available on PD 10. Can you help me please? Thanks!